When mobility is reduced, it can not only become inconvenient but frightening getting in and out of the bath, never mind the wet conditions that come with it especially when living alone. Don’t risk having a fall or a mishap in the bathroom any longer when the solution is simple; a bath step. 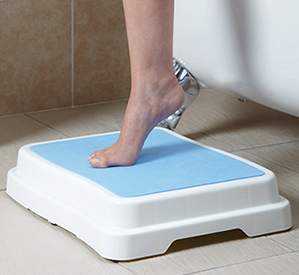 This neat, extra-large bath step by Ideaworks provides a much needed four inch boost to assist you in exiting your bath tub or shower safely and easily. Its design incorporates a slip-resistant textured top so your feet will comfortably grip its surface and rubber coated feet which enable you to confidently climb in and out the bath alone or assisted even in wet conditions. Additional steps can be stacked on top, adding two inches each if you feel like you need something a little higher. The strong step can hold up to 418lbs in weight and measures 19 3/4 x 16 x 4". Who can benefit from a bath step? Although they are perfect for the elderly and and as a disability aid for those with limited mobility, bath steps can be enjoyed by the whole family! They are also great at providing that little boost for children and help reduce the risk of any family member slipping over on a wet floor when exiting the bath. The bath step makes a wonderful addition to any household bathroom. Sometimes it's the smallest alteration which can make the biggest difference to your life. This neat and tidy bath step won’t stick out in your bathroom, nor spoil its aesthetic value. It’s safe, simple and will enhance your independence. Don’t hold back any longer, start making those alterations to make your life easier and more enjoyable, the bath step by Ideaworks will make a fantastic start. 19 3/4 x 16 x 4"